A110-1 ACFT IN TFC PAT (1225 FT AGL) AT WHITEMAN AIRPARK 5 MI NW. A110-11 HANG GLIDER ACTIVITY BTN 5 & 10 NM NORTH OF ARPT 6000 FT AGL SR-SS. A110-12 TWY G RSTRD TO ACFT WITH WINGSPAN OF 95 FT OR LESS. A110-14 POWER ENGINE RUN-UPS FOR ACFT GTR THAN 1200 LBS PROHIBITED IN ALL AREAS EXC ON TWY D RUN-UP AREA OR AS COORDINATED WITH ATCT. A110-16 14 FT BLAST FENCE 35 FT FM DEP END RY 15. A110-17 14 FT BLAST FENCE 93 FT FM DEP END RY 33. A110-18 8 FT BLAST FENCE 260 FT FM DEP END OF RY 26. A110-20 14 FT BLAST FENCE 256 FT FROM DEP END RY 08. A110-21 TWY A RESTRICTED TO ACFT WITH WINGSPAN OF 171 FT OR LESS. 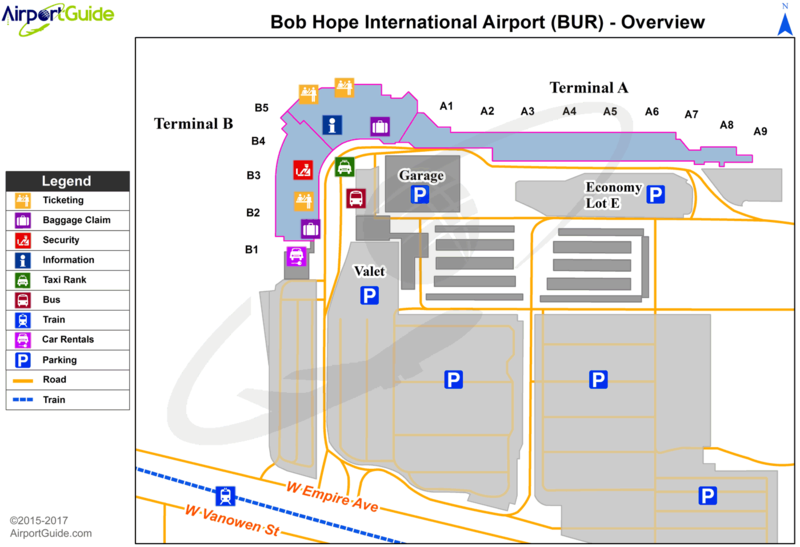 A110-23 PILOTS SHOULD CALL AHEAD FOR ARPT NOISE RULES (818) 840-8840. A110-24 RSTRS AND FINES EFF 2200-0700 FOR STAGE 2 JETS, CERTAIN PROPS, RUN-UPS AND FLT TRG ACT, CALL (818) 840-8840 BFR OPRG. A110-25 HELICOPTER ARRIVALS RESTRICTED TO RY 08/26 AND 15/33. A110-26 NONSTANDARD BLUE TWY CENTERLINE ALONG THE WEST END OF TWY DELTA USED TO BYPASS THE ILS CRITICAL AREA WHEN DIRECTED BY ATCT. 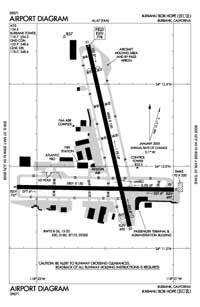 A110-27 TWY B RESTRICTED TO ACFT WITH WINGSPAN OF 79 FT OR LESS BEGINNING 300 FT NORTH OF TWY D AND CONTINUING NORTH. A110-28 NO GA ACFT PARKING AT TERMINAL RAMP. A110-30 ACFT WILL USE EASY PWR WHEN LVG ASGND GATE. CTN MUST BE USED WHEN TAXIING FM TRML AREA DUE TO CLOSE PROXIMITY TO THE TRML. PSNL AND GND EQUIP IN AREA. A110-31 ACFT WITH WINGSPAN GTR THAN 95 FT EXP BACK TAXI ON RWY 15/33 FOR A RWY 33 DEP. A110-32 ACFT RSTRD FM TAXIING SB PAST GATE B1 ON TERM RAMP. A110-33 ACFT WITH WINGSPAN GTR THAN 79 FT RSTRD FROM USING TWY C W OF TWY C8. A110-34 RWY 26 CLSD TO TKOF/JET ACFT WITH FOUR OR MORE ENGS. A110-35 X-BLEED STARTS PROHIBITED IN ALL NON-MOVMT AREAS INCLG THE AIRLINE TRML RAMP. ATC MAY APV X-BLEED STARTS ON TWY A NORTH OF TWY D, ALL OTHER REQS MUST BE COORDD AND APVD BY OPS. A110-6 BIRD ACTIVITY NORTH END RY 15/33 AND WEST END RY 08/26. A110-9 RWY 08 CLSD TKOF ACFT GTR THAN 12500 LBS. A43-15 VASI UNUSBL BYD 5 DEGREES OF CNTRLN. A43-33 PAPI UNUSBL BYD 2 DEG RIGHT OF CNTRLN. A57-15 APCH RATIO 36:1 TO DSPLCD THR. A57-26 RWY 26 APCH RATIO 11:1 TO THR. A57-33 APCH RATIO 22:1 TO DSPLCD THR. A58-15 +15 FT ROAD 100-200 FT FROM RY END; +14 FT BLAST FENCE; MULTIPLE LIGHT STANDARDS 15 FT FROM END OF RY. A58-26 +28' SIGN 90 FT FM RY THLD, +14 FT BLAST FENCE AT THLD. A58-33 +20 FT POLE 198 FT FROM RY THR; +14 FT BLAST FENCE AT THR. E111 ESTABD PRIOR TO 1959. E60-08 ENGINEERED MATERIAL ARRESTING SYSTEM (EMAS) 170 FT LENGTH BY 350 FT WIDTH LCTD AT THE DER 08. Single Wheel Landing Gear: 120. Dual Wheel Landing Gear: 201. Dual Dual Tandem Wheel Landing Gear: 839.